The final dramatic test in our eight-month long Crash Test Boat series was carried out with serious reservations and concerns, not to mention trepidation. In all our previous trials – including capsize, sinking and fire – we experimented with various ways of coping with emergencies so we could tell readers from first-hand experience which one worked best. But a gas explosion is in a different league. It’s unpredictable and there are no half measures. You either survive, or you don’t. 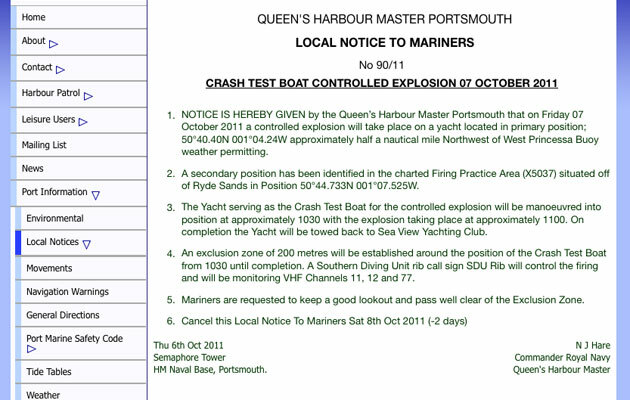 We asked the Marine Accident Investigation Board (MAIB) for details of recent cases where gas bottles were involved in explosions and fires on leisure craft. Steven Clinch, the Chief Inspector of Marine Accidents, gave us a dossier with 18 reported incidents ‘of interest’, most of them within the last 10 years. Many involve motorboats and canal boats, but they also include sailing boat incidents, one resulting in a known fatality. A huge percentage of gas leak ‘incidents’ are not reported unless they involve the emergency services. We know of other incidents abroad that have also not been reported in the UK. 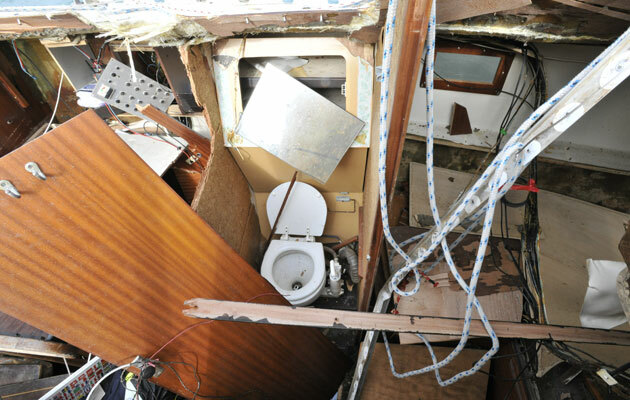 What does a gas explosion do to a boat? We enlisted the help of the Royal Navy’s Fleet Explosives experts, from Navy Command HQ in Portsmouth, for this, the most technically challenging and complex trial in our Crash Test Boat series. David Stopard, an expert in gas installations on yachts, was also our consultant. 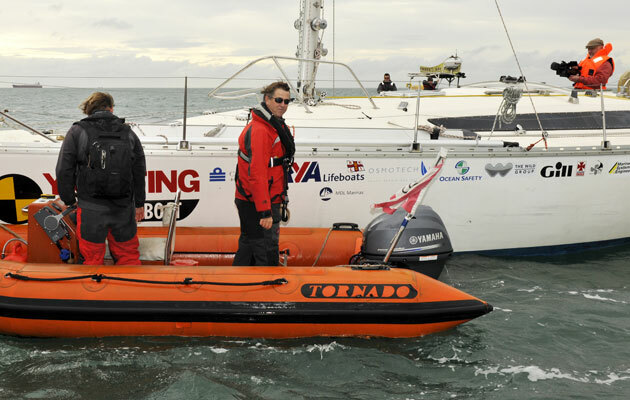 The site chosen for our test was off Bembridge Ledge, at the eastern end of the Isle of Wight, where the yacht was anchored in 8m and a 200m exclusion zone was set up under the watchful eye of the Queen’s Harbourmaster at Portsmouth. On hand to set up the detonation of the blast was RN Fleet Explosives Staff Officer Lieutenant Commander Harry Palmer, with Petty Officer John Spencer. The first attempt failed, after a suspenseful 25-minute wait for the gas to disperse in the yacht’s cabin and mix with oxygen. On the second attempt, a simplified method was used to ensure the crucial gas-air mix. A split second after detonation by a wireless remote ‘trigger’ from the Navy’s RIB, there was a brief orange fireball followed by the explosion. A hundred pieces of GRP debris were hurled skywards amidst a plume of smoke. 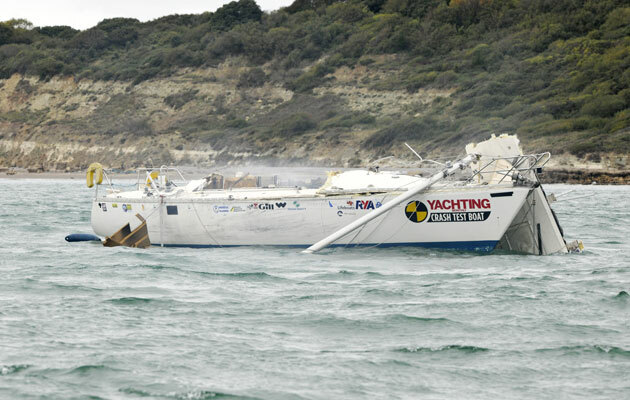 Minutes later, the Crash Test Boat Team sped to the wreck in two RIBs. Gruesomely floating in the water was an ‘amputated’ leg from one of the Crash Test dummies, complete with sailing boot. Next we recovered the torso, cut in half and still wearing its red oilskin jacket. The dummy had been placed standing in the cockpit beside the companionway. As we came alongside, the scale of the carnage was clear. The entire coachroof had been blasted off the hull and seemed to have disappeared. We later recovered it half-submerged and still attached to the jury rigged mast stump which hung over the starboard side. Despite sealing the saloon doors with gaffer tape, in an attempt to limit the spread of gas, the blast wave had extended right through the yacht, from bow to stern. It had blown open the anchor locker and blasted the hinges off the cockpit lazarette. The granny bars had been twisted into some morbid modernist sculpture. Windows had been blown out and the foredeck had buckled and split along the centreline and become detached completely from the hull on the starboard side. Analysis of film footage and photographs reveals that the foredeck was very nearly blown off the boat. Its starboard edge is shown at an angle of 30 degrees to the hull and fixed to the boat only by the bow roller. Its aft edge was a flange of torn GRP trimmed with the deck’s balsa core. Further aft on the starboard side a second split from coachroof to toerail had sliced clean through the starboard genoa track. As the mast of our jury rig had rocketed upwards in the explosion, its Dyneema ‘shroud’, lashed to the toerail, had refused to give way and ripped off the toerail, now a piece of mangled scrap. Climbing onboard, amidst the wreckage of jagged glassfibre and torn metal, the sense of danger and insecurity was palpable. Stanchions and guardwires had been snapped off in the blast like twigs and garden twine. The hull-deck joint had split asunder, and even the knees, which had connected the sidedecks to the hull, had been blown away. Without support, the sidedecks threatened to collapse as we crawled on deck on our hands and knees. The cockpit was the only recognisable structure left more or less intact. Where the deck had lifted, the bridgedeck had splits either side of the companionway. The engine room bulkheads held the cockpit in place. The starboard locker lid had been blown off, exposing the distorted aft bulkhead, which had been blasted backwards and was now wedged in the locker. Looking ahead, into what was left of the saloon, nothing was where it should be, save for the saloon table – with the two gas bottles which had caused the devastation, still intact and taped in position – and the chart table and galley. The galley sinks were blasted out of their wooden frames and lay upside down. 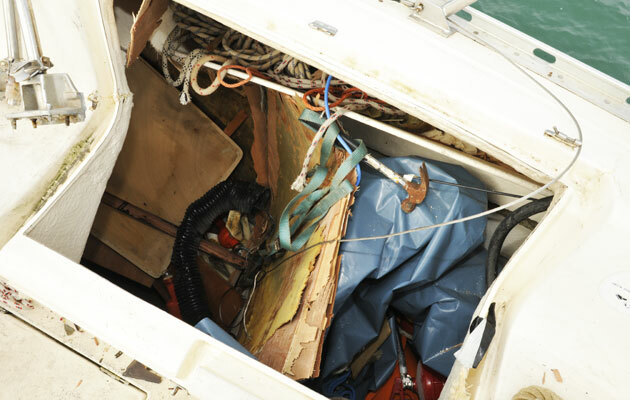 Lockers had been blown open, the companionway steps displaced. Sections of deckhead and sole littered the interior. The doors to the aft cabins were blown in and the forehatch was missing. On reflection, it was not surprising that the saloon table was the least damaged area as it was at the epicentre of the blast, the point from which the shockwave emanated. We were surprised that the Crash Test dummy, positioned next to the chart table and now half buried in the wreckage, displayed no signs of shrapnel damage or scorching – there were no holes in its oilies and it hadn’t moved a great distance. I was astonished to see most of the bulkheads remained in place. A gas explosion has two elements: blast effect and ‘flame event’. The blast effect is the mixture of fuel and air detonating in much the same way it does in the cylinder heads of an internal combustion engine, causing a rapid expansion in volume. This sudden expansion creates the shockwave that causes structural damage, punching through the deck and smashing the interior. The blast effect is accompanied by a ‘fireball’ as the gas ignites. It reaches about 3,000° Celsius but lasts less than a fifth of a second, as revealed by Yachting TV’s cameras, shooting at 25 frames per second. Wood burns at 450° Celsius, so the flame was too short-lived to set fire to the yacht’s furnishings below. We had removed much inflammable material before the test, including engine oil, diesel and distress flares, as part of a careful risk assessment. Safe gas installation is essential. Ideally, have your system inspected and tested annually by a registered gas engineer: GAS SAFE-registered in the UK. Install a bubble gas leak detector. It’s fitted in the pipe downstream of the gas regulator. To test for leaks, shut off gas appliances and press the button. Gas flow is diverted through a bowl of glycerin and bubbles reveal an unsafe leak. Never stow gas bottles outside the airtight gas locker. They can and do leak. Always stow them upright and make sure they are securely strapped into place. It is never a good idea to stow gas bottles alongside inflammables, like this outboard engine petrol tank. 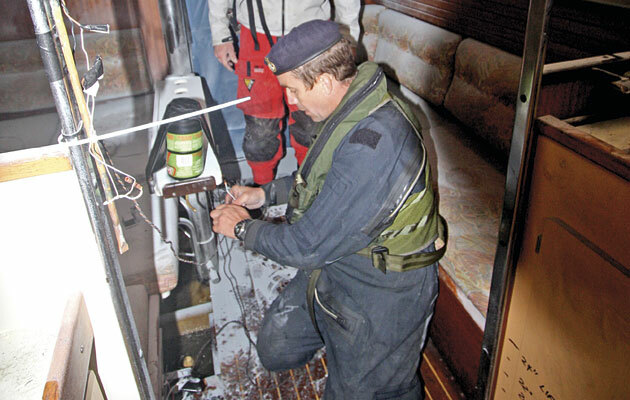 Install a good quality gas alarm, making sure the sensor is at the boat’s lowest point – probably the bilge. The sensor needs to be waterproof. There are tri-detectors on the market that can detect gas, carbon monoxide and smoke, but you might want to fit smoke detectors in each cabin, too, as fires tend to happen where there are people. 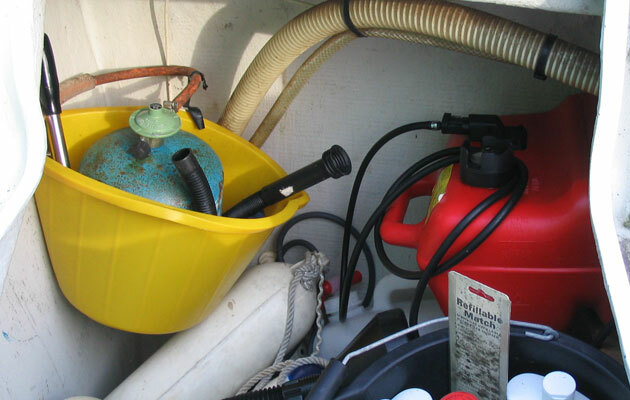 Carry out a visual check of the gas system every time your visit your boat. There are plenty of warning signs of danger. Is you gas pipe chafed? Are the fittings in good shape? Always turn off the gas at the bottle when you have finished using it. 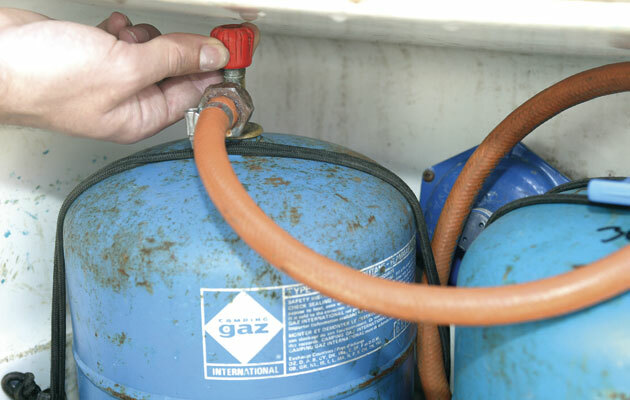 Before you leave the boat, always check the gas locker to make sure the supply is turned off and the regulator is securely attached. 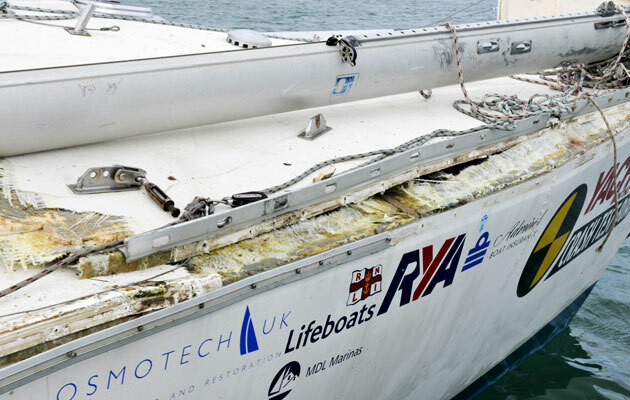 In the Lord Trenchard accident, the gas locker was not gas-tight and gas leaked into the yacht’s main hull. Make sure you have a fire extinguisher and a fire blanket for galley fires. 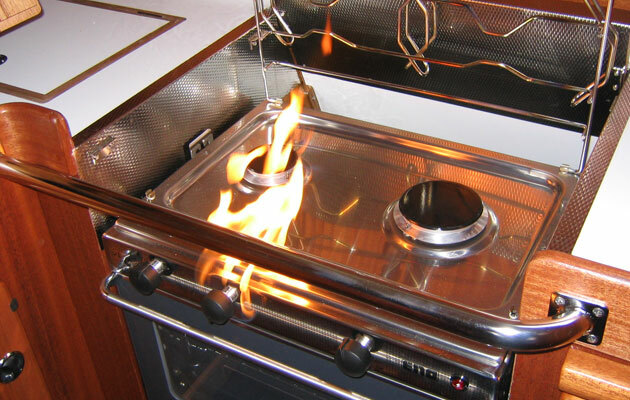 If a fire breaks out in the galley, turn off the gas first, using the shut-off valve. As soon as you can, turn it off at the bottle, too. 1 Don’t panic. Your nose is very sensitive and gas alarms detect leaks at very low levels. A mixture of 2%-9% of gas to air is needed to cause an explosion. 2 Shut all gas cylinder valves to stop any more gas escaping. 3 Turn off gas appliances, electrical equipment and your engine. Don’t switch off the battery bank because that will turn off your alarm, plus VHF radio, GPS and nav lights, which you may need. 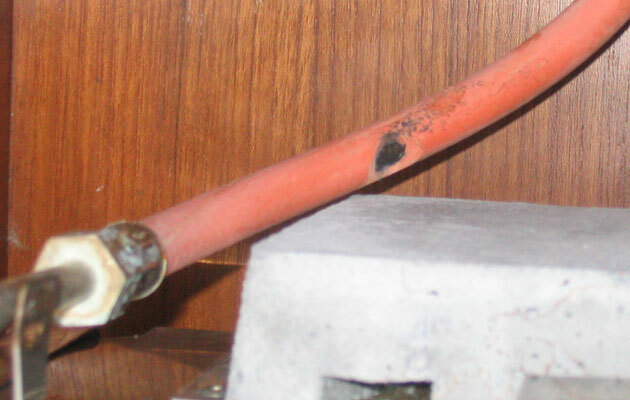 It may seem obvious, but don’t look for gas leaks with a naked flame. 4 Ventilate the boat by opening all hatches, windows and lockers. Lift the sole boards if you can without risking sparks – don’t use an electric screwdriver if they’re screwed down. 5 Manual bilge pumps can only shift around a cubic litre per stroke and there are several thousand litres of air mixed with gas in your saloon. It’s quicker to grab the washboard and waft air towards the companionway. Turn on the gas alarm occasionally to see if it still detects gas. 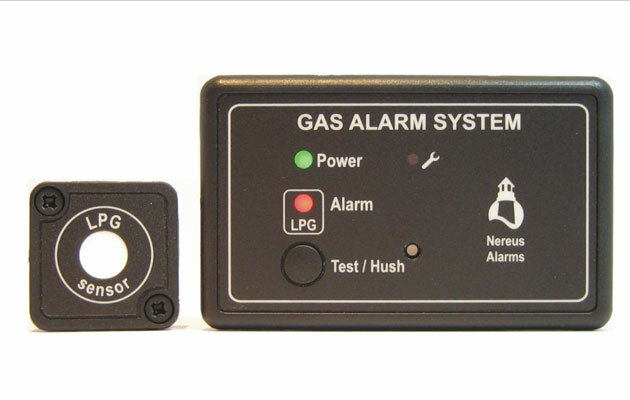 6 Don’t use the gas system again – even if the alarm has stopped and you can no longer smell gas. Get it checked by a Gas Safe engineer. Marine Accident Investigation Branch reports of incidents of explosions or fires involving gas bottles, show that in many cases a gas detection system was not in use or failed to work. So how safe are thousands of boats used around the UK that have not had a Gas Safe Registered check? 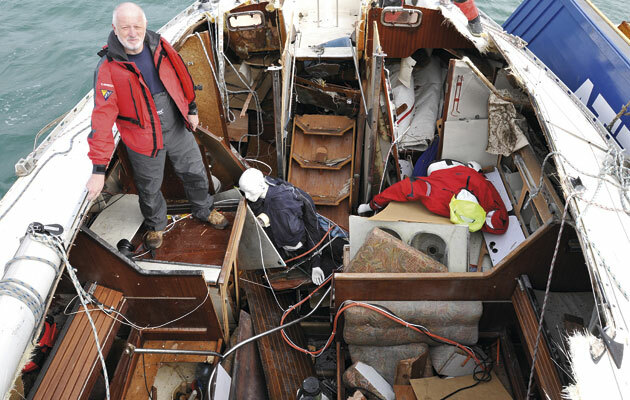 Many yachts have had poor DIY work carried out, says gas expert David Stopard. Is your system safe and when was it last checked? 2004 A fire and explosion was caused when the crew of a boat were changing gas cylinders with candles alight in the cabin. The vessel was declared a total loss. 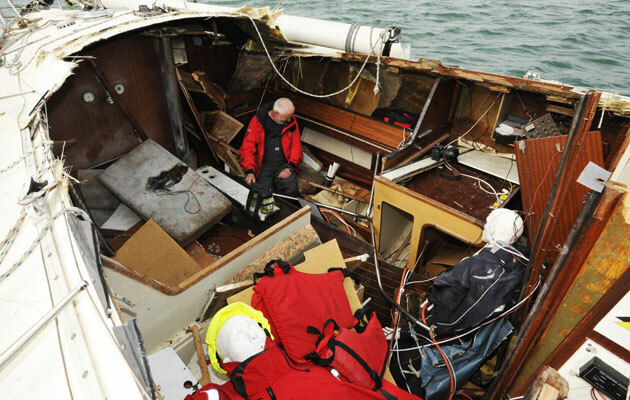 2005 The deck of a 22ft sloop, berthed in Emsworth, West Sussex, was blown off and the owner later died in hospital. Multiple explosions were caused by gas and an outboard petrol tank that ignited. 2005 A fire on a sailing yacht on passage for three days was thought to have been caused by a gas leak. A gas detector on board had not gone off during the incident. Two crew abandoned ship and were rescued from their liferaft. 2006 A suspected gas leak on a motorboat in Brighton Marina resulted in the owner suffering serious burns. 2007 An explosion on a boat in Scotland was caused by a leak in the gas pipework to the stove. Two crew suffering burns had to swim ashore. One died later in hospital. 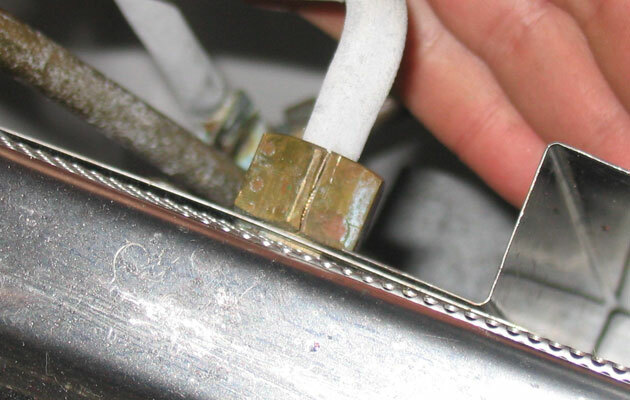 on the cooker ignited by a spark from an electric bilge pump or fridge compressor. 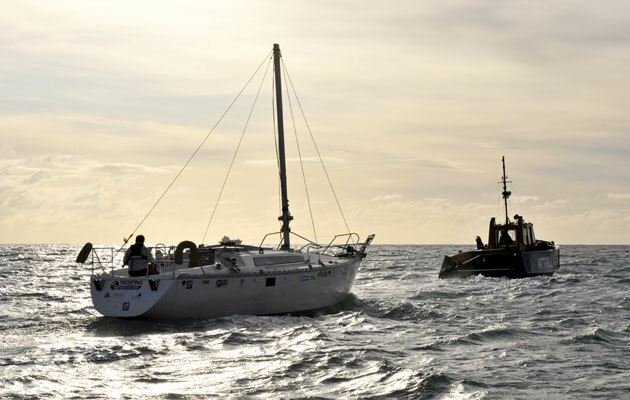 2008 A sailing boat in Pwllheli was declared a total loss following an explosion while the boat was moored in the harbour. The source of ignition was thought to be a Calor gas powered refrigerator. The owner was badly burned but his wife was luckily sitting in the cockpit. Both were taken to hospital. 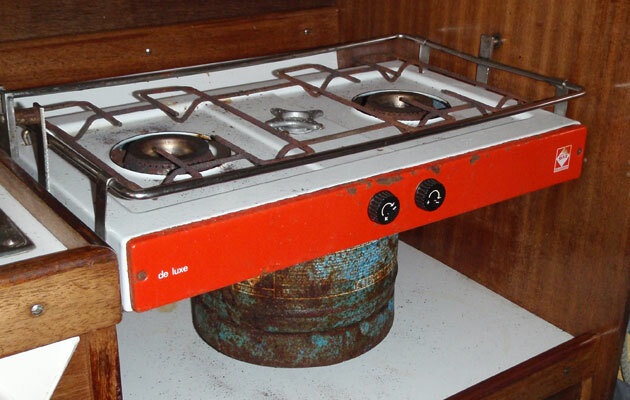 2010 A Cornish Shrimper on the Norfolk Broads suffered a small explosion when a camping stove being used in the cockpit was not properly turned off after boiling a kettle. The accumulated gas leak caused an explosion and minor burns to the crew. ‘There’s a fair chance the yacht won’t survive,’ said the Royal Navy’s Fleet Explosives Staff Officer, Lt Cdr Harry Palmer. ‘We only want to do this once.’ he added. ‘I’ll be surprised if the deck is left on’ was the prescient verdict from Peter Spreadborough, of Southampton Calor Gas Centre Ltd (SoCal). 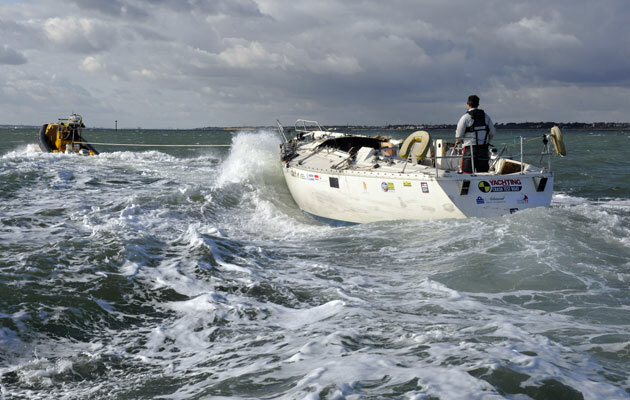 Like most of our Crash Test Boat experiments, the results were not predictable. 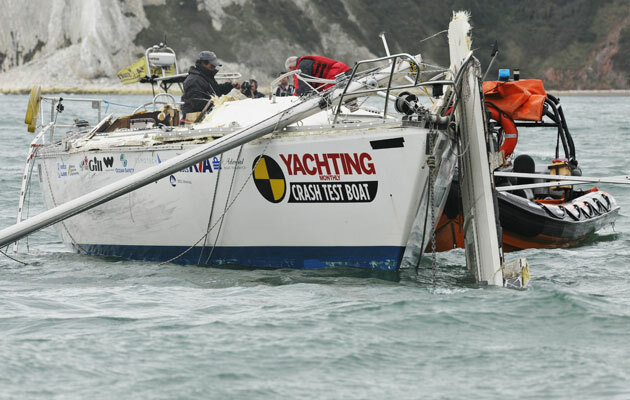 The two worst-case scenarios were complete failure to trigger an explosion, or creating such a big bang that the yacht sank. 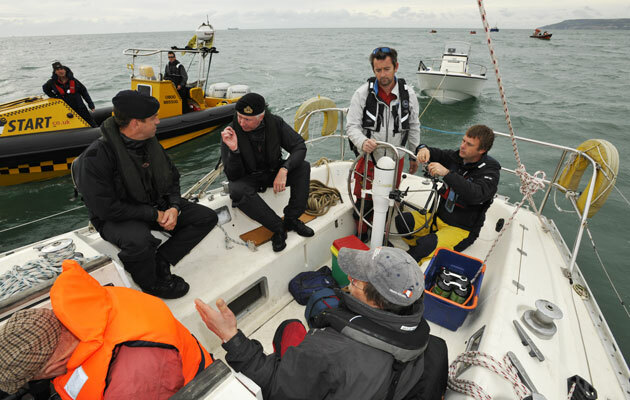 Owner, Robert Holbrook, MD of Admiral Insurance, confirmed we were covered for ‘removal of wreck’. We had a salvage vessel from H Attrill & Sons Ltd, one of the oldest boatbuilders on the Isle of Wight, standing by with a pump and lifting gear. To create a gas explosion you need a mixture of 2%-9% of gas to air. We sealed the saloon from the rest of the accommodation so we were dealing with a known volume, calculated at 18,900 cubic litres. Too much gas, or too little, and the ‘brew’ is unlikely to detonate. Gas safety experts, David Stopard, of Marine Systems Engineering, and Peter Spreadborough, decided to use two 465g propane canisters, containing a total of 517 litres of gas, a mere 2.7% of cabin volume. 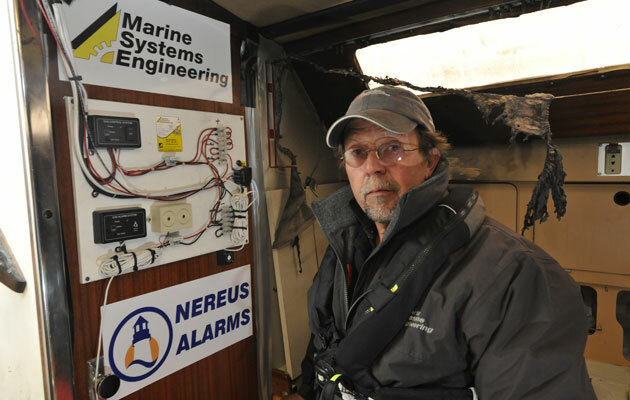 A plan to deliver the gas into the yacht in a controlled manner was devised by Stopard with Kevin Stockwell of Nereus Alarms. 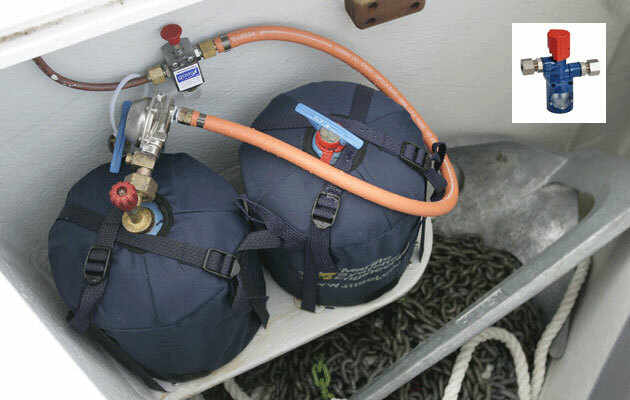 The gas cylinders, placed in a basket in the cockpit, would feed gas into the yacht’s saloon via a long hose. A small electric computer fan on the saloon floor helped to mix gas and air. A Nereus alarm system was fitted with two pre-calibrated LPG sensors. A high-pitched alarm would activate when the gas-air mix reached an explosive level (5%). If detonation failed, a solenoid switch would shut off the gas and switch on two fans to disperse gas through the hatchway. A second alarm, with a low-pitched noise, would sound the all-clear when it was safe to go aboard. Everything was powered by a sealed motorcycle battery in the cockpit. The plan was approved at a meeting at the Royal Navy’s Command HQ in Portsmouth, by Lt Cdr Harry Palmer and Dan Archer, Diving and Explosive Ordnance Disposal Officer. The Navy would take charge of detonation using military grade ‘flash igniters’ (a sort of ‘electronic matchstick,’ said Harry). They would be triggered by radio signal from a Navy RIB sent to a control box mounted on a yellow float on the deck of the Crash Test Boat. David tested the theory outside his workshop, filling a small cardboard box with gas. When the high level alarm sounded, he lit the gas with a Piezo igniter. Singed eyebrows were proof of success! ‘I realised we had to half-open the gas bottles to stop them freezing up, which meant the saloon would take 25 minutes to reach ignition level,’ he added. It was a case of ‘will the last man on board turn on the gas’. LPG was piped into the saloon and dispersed through a drilled copper pipe attached to the deckhead to give the best chance of mixing with air. Royal Navy Petty Officer Diver Simon Spencer installed several flash igniters around the pipe which would be triggered simultaneously. The system was primed and we retired beyond the 200m exclusion zone. After a tense 25 minutes no alarm sounded. We decided to attempt ignition anyway. The countdown ‘3-2-1… fire!’ was followed by silence. Ten seconds later, smoke was seen wafting out of the hatchway. ‘Puff of smoke but no cigar!’ was David’s verdict. Without waiting for the ‘all-clear’ alarm, Lt Cdr Harry Palmer took the Navy RIB towards the yacht with David Stopard onboard. ‘I turned off the gas cylinders and PO Spencer put out a small fire in the saloon with a dry powder extinguisher,’ said David. The fans were switched on to disperse smoke and powder. Failure was thought to be due to three factors: the gas cylinders had partially frozen, slowing gas flow. A gap in the washboards allowed too much ventilation. The flash igniters weren’t low enough. For the second attempt David mounted the canisters lower down. They were turned upside down so the gas left the bottle as a liquid, which soon evaporated into a white cloud of vapour. No more freezing problems. PO Spencer rigged new igniters and the system was primed again. The companionway hatch was closed and taped up. After a couple of minutes, the high level alarm sounded and we all retired the full 200m, near the RNLI’s Tamar class lifeboat. This time it took just five minutes before the command to detonate was given. She’s been called ‘the unluckiest boat in the world’. 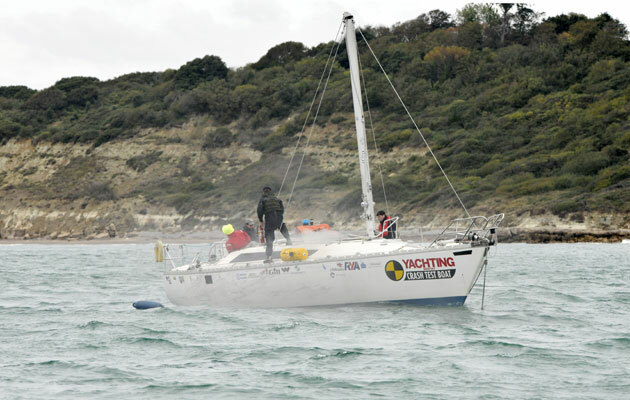 The valiant Crash Test Boat’s final, poignant voyage afloat was under tow with Sea Start. bridle attached to the forward cleats wouldn’t tear off the deck, which was no longer joined to the hull or bulkheads on the starboard side. Fortunately, the remaining bulkheads left her with enough rigidity to ride the Solent chop without the hull crumpling. The yacht safely arrived back at MDL’s Hamble Point Marina, though her new ‘cabriolet’ configuration did take in some water from spray. 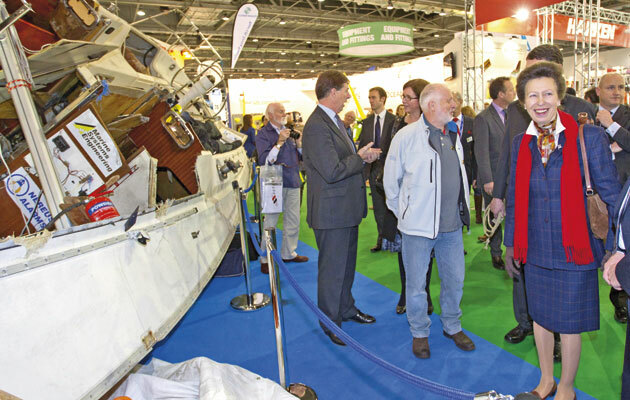 Footnote: After a starring role at the London Boat Show in 2012 and a visit from HRH The Princess Royal, the Crash Test Boat made her final journey, to Lowestoft, Suffolk, where students at the International Boatbuilding Training College practice their repair skills on her.